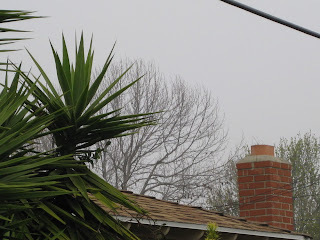 We awoke to a world of white as the marine layer crept onto the land and covered the city with fog. The boys ran into the back yard to dance around and sing its praises, Nathan shouting fog-a-lujah (as in hallelujah), and Benjamin declaring that he loves it when it's froggy outside! With an expected high of nearly 80 today, the fog is always a great way to start the morning off nice and cool!